Recent case studies of how different local actors tackle issues of digitalisation and resilience from a regional perspective is adding weight to the ongoing work of the thematic working groups delivering a major part of the output of the current Nordic co-operation programme on regional development. Three thematic groups have been set up by the Nordic Council of Ministers to explore new paths towards better regional development. The work is well underway and a number of projects have been launched. The Nordic thematic group for innovative and resilient regions recently launched three discussion papers, to start up a dialogue with stakeholders and experts. The papers focus on resilience, digitalisation and smart specialization and the hearing process will hopefully qualify the final output and help meet the needs of potential users of the results even better. The reports are produced by Nordregio, an international research centre for regional development and planning set up by the Nordic Council of Ministers. A series of case studies are now launched to build on the empirical work for the studies. 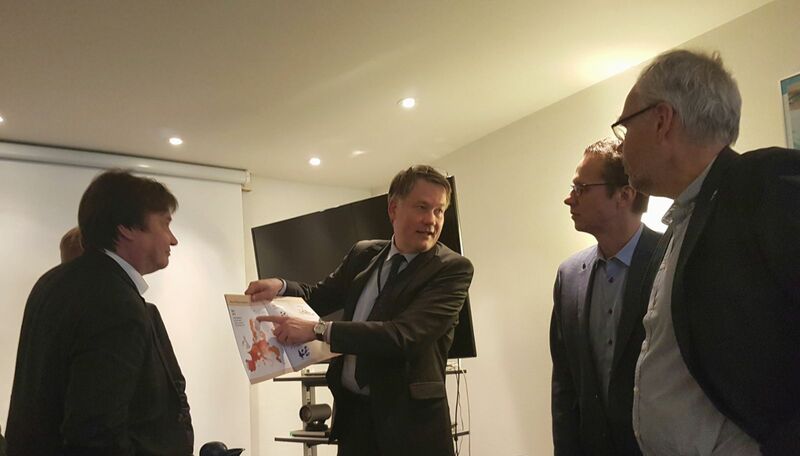 A recent visit to Tampere threw light on innovative ways to handle digitalisation. Here, digitalisation is not seen as a specific policy priority, but as a cross cutting theme integrated into all aspects of operation through different types of experiments and new ways of working. Facilitating collaboration between public and private actors is high on the agenda and projects range in focus from circular economy to eHealth to mobility to agriculture, both urban and rural. Ideas include rethinking education to focus on the development of a more flexible complement of skills as opposed to preparing for fixed professions. There is even a pilot project using artificial intelligence to train robots to work with unemployed people. The concept of resilience – and the capacity to adapt activities and model policies in accordance with changing economic and social landcapes – is high on the regional development agenda and thus also central to the work of the thematic group. The economy of Norrbotten in Northern Sweden highly depends on natural resources, including mining, forestry and derivates (e.g. paper & pulp), and rivers for hydroelectric energy production. Information and Communication Technology (ICT) also has strong roots in the region, first with Ericsson and Telia and more recently in a broader landscape of smaller companies. Preliminary findings confirm the importance for Norrbotten to be at the forefront of technological and innovative solutions. Close collaboration with Luleå Technical University (LTU) has among other things supported public services by providing digital solutions to e.g. education and eHealth. More recently, the region has been able to turn its “weaknesses” (cold weather and low population) into their advantage. Facebook decided to establish its first server infrastructure outside of the US in Luleå because of the low costs of cooling and high availability of hydro energy. Another resilience study currently on its way focuses on Northern Ostrobothnia in Finland and the problems encountered by Nokia, that resulted in a major economic downturn for Oulu and the whole region. The overdependency on a single company, and a single product, the mobile phone (wireless proved to be highly risky. However, the response of the regional actors drove the region to re-bounce towards a renovated and more resilient development path. The immediate response of public institutions, the close collaboration between regional actors and the effective use of financial instruments made it possible to take quick actions. Today, the ICT sector around Oulu has spread the risk into numerous SMEs and start-ups with a much broader offer of products and services. As part of the ambition to diversify the ICT sector, better connections between digital technologies and the traditional industries are being explored to improve productivity and spread the risk, for instance in forestry, mining industries and most importantly eHealth. New ideas are also being tested to re-use existing structures such as particle physics and seeds labs inside old mines. The work with the two case studies in Norrbotten and Ostrobothnia will include a transnational comparison of the cases, to be prepared in co-operation with the Bothnian Arc organisation. The pilot case study on Smart Specialisation (S3), as part of the thematic group on Innovative and Resilient Region, focuses on Stockholm. This preliminary study points out key issues with S3 as a policy tool in the Stockholm region, questioning whether the concept can work for major urban centers. It has also highlighted some interesting aspects of S3 as a tool regarding the implementation of the concept, particularly when considering questions of ‘ownership’ and leadership, the role of the ex-ante conditionality for the access of funding from the EU level, and clear communication. Smart Specialisation is not formally adopted in Stockholm due to the already existing innovation strategies, but S3 will most likely be a conditionality for future EU Regional Funding opportunities. It will be interesting to see whether the amount of funding in place will be enough to entice the Stockholm region to place smart specialisation on the agenda, or whether S3 is indeed beyond the scope of big cities. Parts of the work of the thematic group will be presented at the next meeting of the Nordic Committee of Senior Officials for Regional Development under the Nordic Council of Ministers in May and the final result of the three reports underway is expected at the end of 2018.